One of Egypts more fascinating traditions was that of mummification. Ancient Egyptian mummies were simply put, the bodies of dead people and animals which were preserved through a specific process known as mummification. These preserved bodies have been found in all the major Egyptian pyramids which served as the burial site of the Pharaohs and other people of the Egyptian elite. While the process of mummification existed in various other countries, it was particularly popular in Egypt because of its dry climate which allowed ancient Egyptian mummies to remain preserved for a very long time. Specific burial rituals were followed for ancient Egyptian mummies. During the earliest times the common way of disposing of the dead was burying them in the ground; Mud-brick tombs known as ‘mastabas’ followed and these became the precursors of stepped pyramids. The process of mummification itself was among the burial rites of all Egyptian people. Mummification however was costly and could only be afforded by kings or wealthy Egyptian people limiting it to the very elite of this society. Another important burial rite for ancient Egyptian mummies was that the ‘Book of the Dead’ was buried along with the dead. It was thought that the souls of individuals met their bodies once again in the ‘underworld’ and thus food was buried along with the ancient Egyptian mummies should they get hungry on their journey. 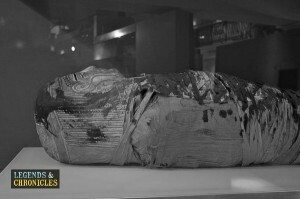 An example of a female Egyptian Mummy. Various methods were used during mummification, the first step was the dehydration of the body in order to protect it against insects. The skull was then rinsed with various drugs in order to kill the bacteria. Embalming the mummy was an important part of the process and was done by experts. The embalmers also removed the contents of the abdomen and the separated organs were sometimes saved in jars. After rinsing the abdominal cavity with wine and fragrant herbs, it was filled with myrrh and cassia. When dehydration of the body was completed, it was wrapped in linen bandages. Death masks of diseased people were also among the burial rites in ancient Egypt. The sculpted mask was put on the face of the diseased person before the burial. This burial rite, along with others, was related to the beliefs of the ancient Egyptian religion. According to these beliefs, the mask strengthened the spirit of the mummy and helped it in fighting off the evil spirits in the underworld. Since gold and gems were used in the masks, only kings and the rich could afford them. An Egyptian mummy showing the skull and its mask. Various religious symbols were used during the burial rites of ancient Egyptian mummies. One was called ‘ankh’ which was s symbol for eternal life. In the paintings on tombs, gods are often shown holding this symbol to the deceased people. This image signified the offering of the ‘breath of life’. ‘Be’ was the symbol of a living personality which left the deceased upon their death. Another important symbol was called ‘ka’ which meant spirit or soul. It was thought to come into existence with the birth of a person and go on living even after death. A wide range of death rituals and rites were used when preparing and resting an Egyptian mummy. These burial rites were practised as early as 4000 BC and preserved bodies have been found from the tombs that date back to 3400 BC. Eternal life and existence after death were the two most important themes of religious rituals associated with burial. 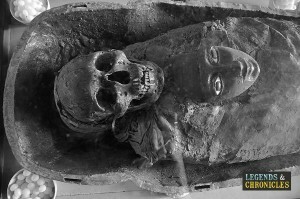 The body of the diseased was preserved because it was thought that their soul would once again meet them after death. Death masks were generally made of gold and gems and were reserved for the elite. A well preserved mummy at the San Diego Museum of Man. The Book of the Dead was one of the most important parts of the burial rites of ancient Egyptian mummies. This book was a special funerary text and consisted of various spells and prayers to prepare the way of the dead people for the journey into the underworld. The Book of the Dead began to be used soon after the establishment of the New Kingdom around 1550BC and continued to be used till 50BC. Over a period of thousand years, many priests made additions to it. During the process of mummification of ancient Egyptian mummies, the internal organs of the body were removed by the embalmer. This was essential for the process of dehydration which was required for mummification. The removed internal organs were then separately preserved in jars known as Canopic jars. These jars, along with the process of mummification, were used throughout the various kingdoms of ancient Egypt. Interestingly, each organ was placed in a separate jar and thus four jars were used for the preservation of stomach, intestines, lungs, and liver. These organs were preserved because it was through that ancient Egyptian mummies would need them in the afterlife. Mummification and burial rites were part of the ancient religion of Egypt which was mainly polytheistic. There were many gods and the people could directly pray to the gods. The Pharaoh was important in the ancient religion of Egypt as he was considered the descendant of the gods. Rituals and offering to the gods were thought to benefit people in everyday life and maintain the order of the universe. The burial rights of burying the Book of the Dead and preserving the bodies and organs of the diseased etc. were also included in the beliefs of ancient religion of Egypt. Various grand temples and edifices were constructed for the gods of ancient Egyptian religion. Mummification of ancient Egyptian mummies is one of the most fascinating aspects of ancient Egypt. 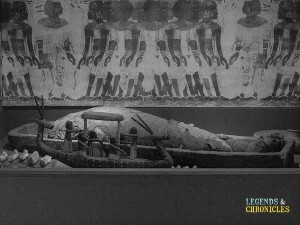 The process of mummification was a delicate one and various experts were used for it. The body of the diseased was dehydrated and internal organs were removed from it. These organs were separately preserved in special jars. Along with ancient Egyptian mummies, Book of the Dead was buried which was thought to lead them in the underworld. These burial rites and beliefs of the people stemmed from the ancient religion of Egypt.